I began my love affair with figs a few years back when I found them at my little corner grocery in Des Moines. They were dried calimyrna figs and they were so yummy! I recently came across some dried black mission figs and have fallen in love all over again. They are perfect for an after dinner snack when you need just a little something sweet…they have a gooey, fudgey consistancy with teeny tiny little crunchy seeds inside that you eat with it. They even come with a little “handle” (stem) to hold on to while you eat it. When you are looking for them, try to find them in bulk instead of in a bag that has been sitting on the shelf for awhile. Those tend to be very hard and dry instead of moist. Calimyrna figs will be a bit drier anyway, but are still gooey in the middle. I could literally eat an entire bag of these…but I try to resist 🙂 Bella loves them too…they’re a great mid-afternoon snack for a hungry toddler! I have been looking for figs in my local area and have yet to find them. I’m really interested in experimenting with them. Figs are also alkalizing, which is helpful for our (typically) acidic diets. And they’re delicious, so many kinds! i went out and bought some of these on your recommendation… YUM!!! 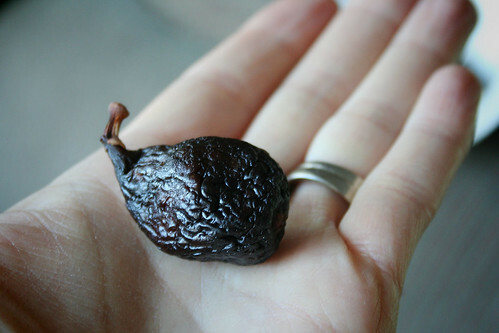 I’ve been searching for figs that look like this all over the place, and the only ones I can find look like little dried up nubs… Any suggestions? Have you ordered them online ever?